I have to thank Raffael for this as he manages the garden entirely. I can just about manage a bit of dead-heading. I bought dry rooted roses from David Austin, the big one that’s grown up and over a metal frame is “Gertrude Jekyll” with a heavenly scent. 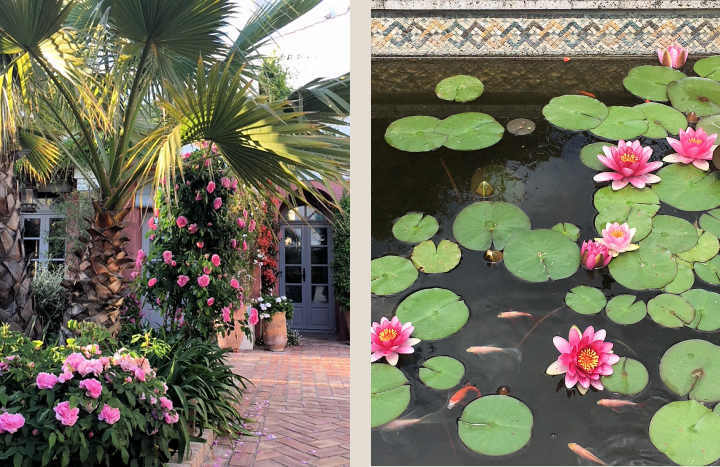 The International garden designer and author, Rachel Mathews, who visited during the Art Gaucin Open Studios weekend I took part in at the end of May, wrote 2 blogs on the Casa Mosaica garden that you can read here, we were very pleased to be featured! As some of you probably know 2018 was my last year with the Art group as I’ve decided to take a break from designing mosaics to sell. 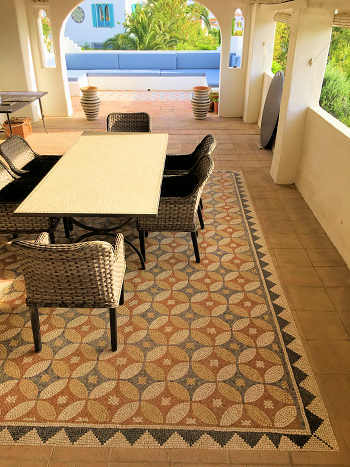 Bespoke mosaics may still be possible to order from me as at the last moment, I found a retailer in Marbella, with an appropriately named shop “Volubilis”, who I hope will go on commissioning mosaics, thus keeping the Studio in Tangier going and the group working. 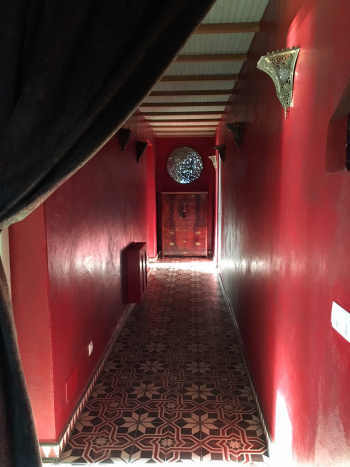 I found it hard to let them all go, so decided to keep a few more including this “Lucilla” mirror, which I’v hung at the end of the red corridor in the Casa Mosaica apartment, it’s astounding how it reflects light all the way from the garden door, I hope guests will enjoy it. The new shower room is at the end of the corridor on the right…..I’ve not got any photos to share yet, but hope the extra shower and the washing machine are useful and look forward to hearing your feedback. I was very happy that all the mirrors were sold and have found new homes far and wide (see photos below) including one looking fabulous in Greece on a wall that looks like it’s made of nougat! And the huge “Lucilla” has gone to Dorset; don’t you love the dogs faces…..apparently they are never allowed on the sofa, this was just for the photo and they were terrified of getting into trouble! In May we took a lovely trip to Ronda on Mr. Hendersons Railway from Gaucin station also known as El Colmenar, (a sub-district of Cortes de la Frontera not Gaucin). We drove to El Colmenar, deep in the Guadiaro valley, about 20mins by car from Gaucin, in time to have a cup of coffee at one of the bars in the peaceful village before boarding the train at 12.41. The train passes through The Cañón de las Buitreras, the strikingly named Gorge of the Vultures, after the colony of griffon vultures that nest in the area. The views are pretty jolly good as the train climbs and winds it’s way through the stunning country side stopping at Cortes de La Frontera (estacion), Jimera de Libar, Benaojan-Montejaque and Arriate before arriving in Ronda at 13.35 and costs just €4.00 one way. I had booked a table at one of my favourite restaurants, Carmen La de Ronda and we had a very pleasant walk through the town before and after lunch as well as some shopping before boarding the train at 19.54 to get back. 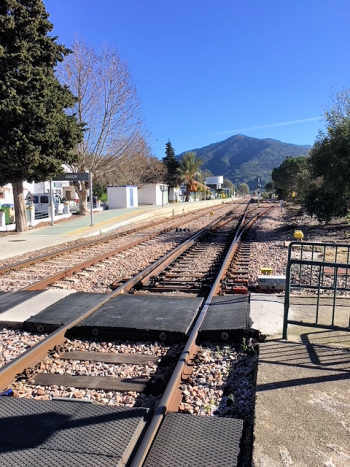 Another lovely thing to do is the walk of Mr Henderson’s Railway from Jimera de Libar to Benaoján it’s an easy walk of 9 kms and takes about 3 hours - one of Guy Hunter Watt’s walks. I drive to Jimera station and leave the car there and plan to arrive at the Molino del Santo in Benaoján in time for a delicious lunch before catching the train back to Jimera de Libar at about 16.00. Unexpectedly I have some last minute availability in La Casita Mosaica and have created a special offer. 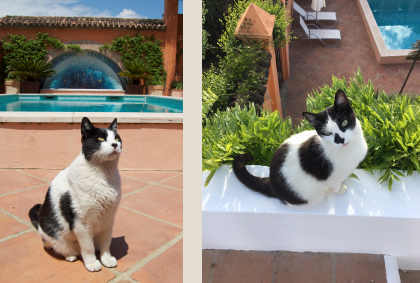 “Romantic Moorish Tower house” for 2 set in the Casa Mosaica garden and with use of the shared pool. Please tell your friends. Looking ahead: La Casita will be available for long winter lets from as little as €250 per week. And new for 2019 high season (6 July - 6 September, at €2600 per week) will be the opportunity to rent both the Casita and the Apartment together sleeping up to 7 + a baby cot and including my lovely private Casa top terrace, which has spectacular views (see below) of The Castillo del Aguila, El Hacho mountain ,and Los Alcornocales National Park (the largest, oldest and greatest cork forest in Europe). It’s the most delightful place to sit in the evenings and I’m hoping renting the entire “Villa” will be a spectacular setting for a totally private family holiday, you will have the whole place to yourselves (no owners on site!). But contact me early about this as most of August is already taken. If you know anyone who might like to subscribe to the Casa Mosaica Newsletter please forward this and they can subscribe here. Ruffi, Raffa, Alex, Maria, Jim, Charlie, Emma and not forgetting of course the very handsome Kevin & Geoffrey.